My THAI GIRL's an Ebook! 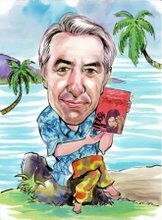 For an author like me it’s earth shattering news that my two books about Thailand can now be bought anywhere in the world on the click of a mouse. They have recently become available as ebooks. **** If you Google the titles or go to Amazon you can find them from many suppliers and you can have them in seconds to read off your Kindle device or your usual computer screen. Images of both books appear to the right of this blog article and you can learn more about them and read reviews and first chapters on www.thaigirl2004.com.> **** My novel, THAI GIRL, is the story of a young Englishman who falls in love with Fon, a masseuse working on the beach on Koh Samet and tells how he discovers Thailand and its culture through his on-off relationship with Fon. 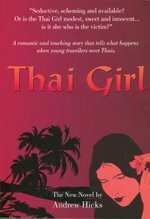 “Thai Girl” was first published in Thailand in 1974 and again by Monsoon Books in Singapore, achieving best seller status in both places. It still sells well and is currently reprinting for the ninth time. A friend recently sent me a shot of the books prominently displayed at Bangkok airport which gave me a very good feeling!>**** MY THAI GIRL AND I, “How I found a new life in Thailand” is my own story of how early retired and living in Thailand I met my future wife, Cat, and how we set up home in the rice fields of North Eastern Thailand. The book is written as a collection of short anecdotes, not unlike the blog articles below. It tells my tale of falling in love in and with Thailand, together with all the joys and tensions of a cross-cultural relationship and of living far from home. It’s an easy read and, I hope, a funny one that can be dipped into as well as read straight through, though I hope you’ll find it hard to put it down!>**** This book has been a special pleasure for me as I have made many friends from it among readers who have had similar experiences or dream of escaping the western rat race, so I am happy that it can now be bought anywhere in the world. In fact as the book has over 100 photos, an ebook is perhaps better in that these all appear in colour and are far sharper than on the printed page.>**** The emergence of the web and of ebooks is causing a revolution in the world of publishing and books. It is said that in the US Amazon now sells as many ebooks as it does conventional books and that these are the future. I struggle with this because I still love the feel of a physical book and of the rows I have stacked tightly on my bookshelves as a reminder of past pleasures. On the other hand, the big publishers and book sellers have had a strangle hold on the book trade which has tended to inhibit the publication of new authors and fringe topics. Now it’s a new world out there with the emergence of ebooks and of ‘print on demand’ books where no physical stock is held but a book is printed off and bound whenever an internet order is received.>**** The availability of books on the internet, obviating the need for visiting a bookshop, is another side of the revolution. This applies not only to new books but to second hand and out of print books too. For the bibliophile or researcher, gone are the days of trawling through dusty second hand bookshops looking for that rare out of print title. Now all you have to do is go online and you can find any number of copies available and order and pay for one in a matter of minutes.>**** This is wonderful for readers of books. It presents a problem though for publishers and authors as an accessible market in second hand books must inevitably inhibit sales of new books.> Authors generally have to be satisfied with minimal royalties on the price of new books sold and have always complained that multiple reading via lending libraries means that they cannot make a living. I have always thought that a book is almost a sacred thing that should be kept and passed on for others. Now I can’t help feeling that a mass produced paperback should be read and discarded just like a newspaper. The new internet market in second hand books however means that the life of a book can be indefinitely renewed as it is sold on from reader to reader.>**** Writing and creativity does need to be stimulated and in general the new world of books will promote this. I therefore welcome the brave new world of ebooks and commend it to you. Ebooks are cheap to buy and great for the reader and at least they cannot be sold on and recycled. The world of reading is thus becoming a better and richer place.>**** In any event I cannot be a luddite as ebooks are here to stay and if you can’t beat them… just as in “My Thai Girl and I” I advocate that expats living in the cultural melting pot of Thailand can only find happiness there if they learn to ‘go with the flow’.